If managing your vacuum cleaner takes more effort than actually cleaning your carpet, it is probably time to trade up that vacuum cleaner for a lighter one. Getting dust out of upholstery, crevices and corners can be frustrating enough. But a cumbersome vacuum cleaner only makes it harder and does not even do the job any better than a lightweight one. Besides, it’s not as convenient to store either. All the bulk for no extra benefits! If you’re looking for the perfect lightweight vacuum cleaner for yourself, look no further. The following is some information and features I pulled out during the course of my research for the best lightweight vacuum cleaners. I will be introducing you to three of the best options I found for you which may tick off several things on your checklist. My job is to present you with all the relevant information but you are free to make your own decision based on your requirements and budget. Given the polluted times the world lives in, your house could use an occasional vacuuming. The lighter the vacuum cleaner, the better – who needs all that baggage? The Shark Duoclean Cordless is a compact, cordless and hassle-free vacuum cleaner that is a convenient and easy way to get your cleaning done. The cleaner is quite literally the vacuum filter attached to a handle. You can simply clean all around you, 360°, without entangling yourself in the wire or constantly manoeuvering so the cord doesn’t get in the way. The vacuum cleaner comes in four varieties — single battery, single battery with pet power brush, twin battery, twin battery with pet power brush. The single battery is the cheapest option out of the four. The wand or handle is flexible and bends enough so you can reach hard places, even underneath furniture. It also folds so the vacuum cleaner can be stored easily and occupies the least space. ‘Flexology’ also allows you to convert the device into a handheld vacuum so you can clean countertops, tables, etc. with ease. The cleaner has two brush rolls that work simultaneously to remove common household messes. The first brush roll removes both, a tiny speck of dirt or a large mess. The second brush roll allows you to move the device seamlessly from carpet to hard floor without any hindrance. All four varieties of the device come with a variety of versatile attachments — crevice tool, upholstery tool, dusting brush, lithium-ion power pack, power pack charger and an accessory tote bag are available with the single battery model. The batteries can be charged on the vacuum or directly by using any power outlet in your home. The single battery device has a runtime of 22 minutes. All four varieties weigh 4 kgs. 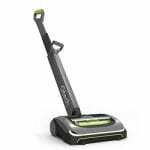 The Gtech AirRam MK2 is a cordless vacuum cleaner that is compact and easy to use. 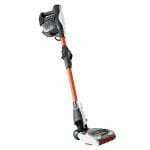 This vacuum cleaner is the cheapest out of the ones I have picked out from my research and is a good fit if you’re looking for something in a budget. The cordless aspect makes the Gtech AirRam MK2 hassle-free, easily portable and compact. No longer do you have to find a socket to plug your vacuum cleaner in to use it in different parts of your home. It’s easy to store, easy to use and easy to carry. It glides freely from hardwood floors to carpet without the need to change any settings. The powered brush head employs a unique AirLOC system that picks up debris as you push the machine forward and then locks when its pulled back to pull in any embedded dust particles. The efficient rotating brush is perfect for picking up minute specks of dust, lint or fine hair. The device is powered by a 22V lithium-ion battery that is removable. You can use the device for up to 40 minutes on one 4-hour charge. There’s an LED display that indicates how much battery is left. It’s incredibly easy to clean the filter. As you’re cleaning, the dirt the cleaner picks up is compressed into a compartment at the front of the vacuum. It can be emptied easily with one slide of the ejector arm. If you’re cleaning in tricky spots, like underneath the sofa or behind a shelf, visibility can be a problem. A full-width LED light allows you to see every speck of dirt so nothing is missed. The Gtech AirRam is very easy to store. It comes without the excess baggage of power cords and can be stowed away in any corner of the room. The lithium-ion battery pack is removable so you can charge it separately if you can’t find a power socket where you want to store your vacuum cleaner. The full-length brush bar makes sure the vacuum cleaner gets all the dirt, even on the edges and corners of the room that are typically hard to get. It’s designed specifically to get into odd corners, ensuring the dirt doesn’t remain hidden away. The main unit of the vacuum cleaner comes along with the upper handle and lower handle (both detachable), battery, charger and a brush bar hole plug. The ensemble weighs 3.5 kgs. The Miele Compact C2 vacuum cleaner is part of the brand’s Cat & Dog range and is perfect for pet owners. The vacuum cleaner is more expensive than the previous one but does have some additional benefits, like neutralizing odours (a true gift for pet owners), an 11-step filtration process and several other attachments that are useful for different kind of surfaces. The vacuum cleaner is lightweight and compact, therefore easy to store. It, however, is not cordless as the other two products mentioned above. Regardless, though, it has an operating radius of 11 metres so you can cover large distances of the room without needing to change the power socket repeatedly. The vacuum cleaner employs an 11-step filtration process so even the finest dirt and hair is sucked in. After being pulled in, the dirt is sealed off in a casing which prevents it from escaping. This will ensure the hygiene of the room while you’re cleaning and allow only clean exhaust air to return to the room when you resume cleaning. It is ideal for pet owners as it can clean up after your cats and dogs, no matter how much hair they shed. The active charcoal in the filter also helps absorb all unpleasant odours. So if your pet brought in dirt from outside or got wet in the rain, the vacuum cleaner eliminates the foul odour. With an 11-metre operating radius, you can clean large parts of the room without needing to change the power socket. The device has a six-stage rotary dial so you can choose the cleaning mode you need, depending on what the chore is. The vacuum cleaner is compact, lightweight and easy to store. The long power cord can be rolled up easily so you can find just the right amount of space needed to store the device and nothing extra. The device comes with Turbo TeQ floorheads which offers a deep clean and pulls in any stubborn pet hair. Other than that, there are additional clip-on tools, like the high-quality upholstery nozzle, dusting brush and crevice nozzle, to ensure you can clean all kinds of corners and surfaces. The device weighs 4.8 kgs. How to Pick the Best Lightweight Vacuum Cleaner? If the vacuum cleaner makes noise. If it’s needlessly noisy, you may want to look for a quieter alternative. If the vacuum cleaner is bagged or bagless — meaning does it collect the dirt in a sealed bag or does it have enhanced filters that seal the dirt in a bag for you? If the vacuum cleaner is suited for your home. Can it clean stairs and high curtains? Can it pick up after your pets? Can you clean your carpets every week? These are all factors that will influence the kind of vacuum cleaner you should buy. If the vacuum cleaner provides HEPA filtration. This will be especially useful if you or anyone in your home suffers from allergies. If the vacuum cleaner is lightweight enough to carry on multiple flights of stairs. If it is compact enough to store without any hassle. If it is cordless or requires a power socket. If it is cordless, you will need to check the battery quality. If it has a cord, check the operating radius of the cord. Corners: The brush bar and the pulling technology should be flexible enough that it can get dirt stuck even on awkward corners and edges of the room. Underneath Furniture: Often cleaning underneath the sofa or behind a shelf can be tricky. The handle of the vacuum cleaner should either be adjustable so it can get underneath furniture without needing you to put too much effort. Or else it should be so flexible that it can bend anyway and reach tricky crevices. Carpets: If you have carpeted floors, those may require the most frequent cleaning. If your vacuum cleaner also comes with a motorised brush, it is likely to do a better job at cleaning the carpet than one which only uses suction. Upholstery: If you have delicate upholstery, your vacuum cleaner should have different power settings and cleaning modes so you can choose which is the most suited to the fabric. Additionally, if you have to reach high curtains or have wall tapestry that needs cleaning, your vacuum brush bar should be able to reach that height easily. Staircase: If you have several levels in your house, not only should your vacuum cleaner be versatile enough to clean the narrow steps (and even get the corners) but it should also be lightweight enough to carry up and down the stairs while cleaning. If it’s expensive, what are the features or add-ons that make it expensive? Are these features useful to you? How frequently do you clean? Is there an alternative that has fewer features but fits in your budget? Does the lack of features make the alternative product less useful to you? For example, the Shark DuoClean is the most expensive out of the three options I have mentioned above. But it does have several features that the other two do not, is lightweight, compact and extremely flexible. However, if those features don’t strike relevant to your circumstance, you can narrow your choices down to the other two. The most unique feature of the Shark DuoClean Cordless is its flexible handle. Only with a click of a button, the wand can bend and go underneath your sofa, behind shelves, into tricky corners, etc. ‘Flexology’ allows you to convert it into a handheld device so you can clean table counters, the kitchen slab, etc. None of the other two vacuum cleaners has this kind of flexibility. For most pet owners, the biggest problem when it comes to cleaning is getting rid of cat or dog hair. The Turbo TeQ floorhead of the Miele Compact C2 Cat & Dog Powerline is built especially to trap those stubborn pet hairs. Its 11-step filtration process ensures even the finest speck of dust is pulled in. What’s more, the activated charcoal also reduces odour in the room, truly making it a boon to pet owners. The Gtech AirRam has a full-width LED light on the brush so you can see if you have missed a spot of dirt, even in tricky areas like underneath the sofa or behind your bed. The Shark DuoClean and the Gtech AirRam are cordless, making your cleaning process incredibly easy, hassle free and quick. No cords mean you can clean around your entire house without needing a power socket. You will also not get entangled in the power cord. The Miele Compact does have a cord but it has an operating radius of 11 metres, giving you enough room to move about with one power socket. Both, the Shark DuoClean and the Gtech AirRam use lithium-ion batteries that are removable. The Shark DuoClean can run up to 22 minutes on battery and the Gtech AirRam has a run time of 40 minutes. The Gtech AirRam also has a screen which indicates how much battery is left. 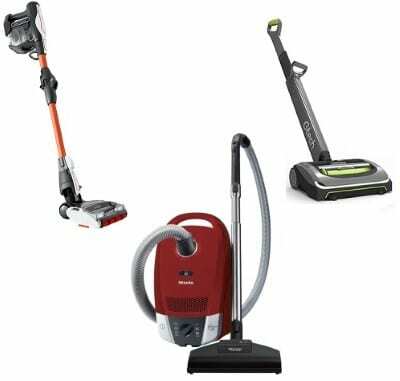 All three vacuum cleaners are fairly lightweight, with the Gtech AirRam weighing the lightest at 3.5 kgs, followed by Shark DuoClean at 4 kgs and finally Miele Compact C2 at 4.8 kgs. Shark DuoClean: The single battery model of the Shark DuoClean vacuum cleaner comes with a crevice tool, upholstery tool and dusting brush. These can all be clipped on, depending on the kind of surface you’re cleaning. Gtech AirRam: The Gtech AirRam is fairly minimalist and comes only with a brush bar hole plug as an add-on. 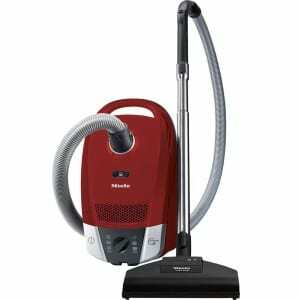 Miele Compact C2: The Miele Compact C2 comes with a host of add-ons. The Turbo TeQ floorheads are for deep cleaning. There is also an upholstery nozzle, a dusting brush and a crevice nozzle that works as a clip on. Read More: Which handheld hoover is the best? From what I assess of all these features, add-ons and specifications, the Shark DuoClean Cordless seems to show the most promise. The vacuum cleaner is lightweight (4 kgs), cordless (so you can clean without getting entangled), has a run time of 22 minutes (so you can use it long enough to vacuum your entire floor and more) and has an incredibly flexible wand (so the handle can bend and clean underneath the sofa too). What’s more, these are all the unique features of the most basic, single battery model. There are three other models that are available for the series which vary in price, features and battery life. The vacuum cleaner can also be converted into a handheld device so you can reach smaller corners easily, clean table tops, curtains and even lampshades with ease. It’s light, compact and portable and can be used to clean the whole room without stopping to look for a power socket. The compactness of the device also means you can store it easily, without any untidy power cords jutting out or eating space. You don’t even need any storage hooks or need to prop it against a wall. Other than the power vacuum, it also has two inbuilt brush rolls which can clean the most stubborn dirt out of the carpet and also move seamlessly from one surface to another, without any hindrances. It comes with clip-ons like a crevice tool, upholstery tool and dusting brush so every nook and cranny of your home can be spotless. Sure, it may be slightly on the pricier side but its convenience, flexibility and light weight make it a worthy buy. From the findings in my research, this Shark product seems to be one of the few that offers this kind of flexibility on the handle or wand with only one click of a button. The quick release wand also extends so you can clean on higher surfaces, like cobwebs in the corners of the ceiling. Besides, it’s only slightly more expensive than the Miele Compact C2 Cat & Dog Powerline and has many more exciting features. So despite the price, I would place my bets on the Shark DuoClean Cordless.